In honor of Julia Childs, I made her Boeuf Bourguignon. This is a once a year event at our house. It is pretty rich…but excellent. With any great dish you have to pair it with a great wine – in this case it’s going in the dish – Chianti. 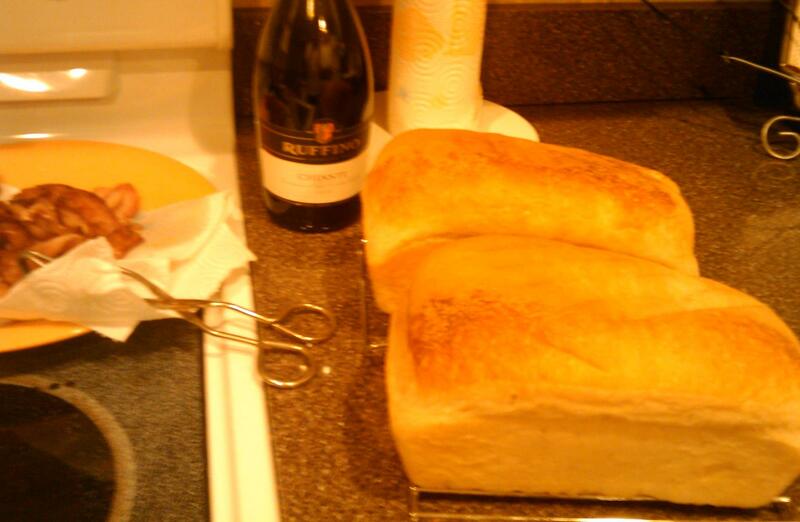 Then also, fresh bread. I don’t follow her recipe to the letter but it is very close. The plate of bacon is a variation instead of the bacon block. Warning: This is not a diet dish. Julia didn’t worry about such things. Use Golden Harvest potatoes – my sister clued me in on those – really good. I’m going running in the morning. Hoping it will be a little warmer than today. The “coach” of our team is coming to town and it will not be hard for him to figure out that I have not been running a whole lot. Let’s not tell. Maybe I can fake him and the others out…I doubt it. Ha! So, I need to really get on it. This entry was posted in Diet, Miscellaneous, Recipes, running. Tagged Bacon, Beef bourguignon, Côtes du Rhône AOC, Julia, Julia Child, Lardon, Olive oil, Tomato paste. Previous Post Previous post: Let the Celebration Continue On! Thanks – it was great. Now I have to go run it off. I still want to make this one of these days. When we were on holiday in Normandy (we stayed at a very nice house in Etretat), I was cooking a similar beef stew but at that time, I never heard of Julia Child yet so my version was missing the bacon and tomato paste. The nice thing when cooking in France is that the ingredients that I can get from the supermarket were amazing such as the stewing beef cuts which really taste so well.